Late science fiction writer Ray Bradbury wasn't referring to investors when he said, "you've got to jump off cliffs all the time and build your wings on the way down," but he might as well have been referring to the upcoming fiscal cliff in 2013. The fiscal cliff is a real crisis looming at year's end. The fragile U.S. economy could face an unparalleled fiscal punch of as much as $720 billion if the scheduled changes go through as planned. They include the Bush-era tax cuts set to expire Dec. 31 and billions of dollars in programmed federal spending cuts. U.S. Federal Reserve Chairman Ben Bernanke has warned that shocks from such changes will most likely cause the economy to contract, causing a recession. And without cooperation from Congress, there's no alternate route for the U.S. economy to take. 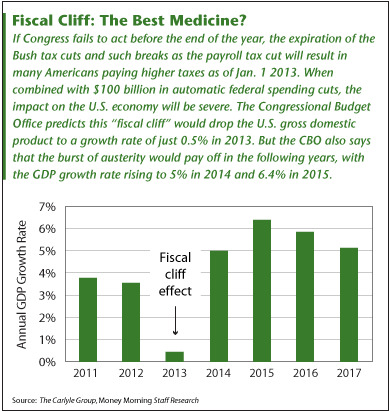 Ernie Gross, Ph.D., MacAllister Chair and professor of economics at Creighton University, told Forbes, "The fiscal cliff is an almost 100% certainty." Money Morning's Chief Investment Strategist Keith Fitz-Gerald, author of 2009's Fiscal Hangover, has outlined three big factors involved in the 2013 fiscal cliff (which were detailed in a recent Forbes article). The first is the enormous adjustment from tax and spending provisions set to expire on Dec. 31. Second is the ballooning U.S. debt, which will have a huge impact on investments. "The lack of a credible fiscal consolidation plan will roil markets and ratings that, in turn, affect everything from credit card rates to pension funding, to collateral provisions," said Fitz-Gerald. "At risk are hundreds of billions in money market funds with several trillion in retirement assets, among other things, not the least of which is America's credit rating." And third is that political leaders don't understand that factors one and two will slap the economy sooner than later. Anxiety about an impending fiscal crisis at year's end will slow job growth and pressure the nation's flimsy recovery. "Profits are dropping, hiring is slowing, earnings growth is slow," said Fitz-Gerald. "If CEOs have a reason to be cautious, they will be when faced with uncertainty, and there's a lot of that." Indeed, just knowing that the economy is barreling toward the fiscal cliff has caused consumers and companies to pump the brakes on spending. "As the cliff approaches, we expect first firms and then households to start positioning decisions, weakening the economy in advance of the cliff. When you are approaching a cliff, in a deep fog of uncertainty, you slow down," Bank of America Corp. (NYSE: BAC) economists wrote in an early June report. This is a time when investors typically get scared from markets, but that's when they miss all the profit opportunities this situation offers. "Investors have to be in the markets. You have no choice," advised Fitz-Gerald. "The real risk is not getting wiped out, but rather getting left behind. The last three stimulus efforts have led to double digit rallies. Get your buy list ready. History shows beyond any shadow of a doubt that staying in the game is good, but buying when stuff hits the fan is best." Investors wary about the impact of 2013's looming fiscal cliff can avoid the brunt of the pain with a little planning and positioning. For starters, Jeff Sica of Sica Wealth Management cautioned investors to pay down debt, keep their jobs, and reduce non-essential spending. "Plan for the worst possible outcome despite hoping for the best. In an uncertain future, hope is not a good strategy," Sica told Forbes. Next, forget U.S. Treasuries. With yields around 1.4%, a record low, Treasuries are not keeping pace with inflation. "At a 2% to 2.5% inflation rate annually, that means essentially if you leave your money in cash for the next few years, you lose 2.5% of that year. And that's a tough principle for people to understand. There're worth 2.5% less each year by doing nothing," Chris Millard of JPMorgan Chase (NYSE: JPM) told the Philadelphia Inquirer. Millard suggested investors consider stocks playing off cheap prices of U.S. natural gas, pointing a finger at utilities that are transitioning from coal to natural gas. These companies, Millard said, stand to benefit over the long run. As a hedge against volatile markets, precious metals, mining stocks and related exchange-traded funds are an option. Fairfax advises investors to apportion money to gold as "we see the potential for further QE in the United States, China and Europe. " Also, rethink the old buy-and-hold mantra. Bill DeShurko, CoVestor Model Manager, told Forbes, "There is absolutely no reason to lose another 30-40% of you investments for the third time in the past 12 years. Buy and hold strategies will once again wipe out wealth that individuals can no longer afford to lose." Instead, switch into low volatility investments, dividend-paying stocks, and prepare for an exit. And finally, take advantage of the historic low mortgage rates; they won't be around forever. So what should an investor do? Let me pick the best out of this amazing article? Buy utility stocks? – great advice yeh they're bound to fly 'over the long run', I thought we said that buy and hold was dead. I'm confused…. A hedge against volitility – precious metals stocks and ETFs (are you kidding!). When the market tanks so will these…. I'm even more confused now…. Buy gold – yes there will be more printing of paper so maybe buy and hold is good after all? Buy low volitility dividend paying stocks and exit just at the right moment, great when will that be then? If you could let me know just beforehand I would be most appreciative however, I'm still confused…. Sorry but this article is very poor – What is an Investor to do? Please give some useful advice this is terrible. Maybe I should become a trader instead? Isn't that what 'timing' the market is? If you buy the market then that will be your return…..
By the way if buy and hold is so dead why are billions of dollars being poured into stocks by savvy investors like Warren Buffet? I bet someone told him 30 years ago buy and hold was dead, why dont you come back and tell me that in 10 years, after I've shown you my profits good company's shares prices will always rise out of the crap – no fear. Buy the business not the market……. WHAT'S BEST GOLD BULLION , GOLD NUGGETS, GOLD ROUNDS OR GOLD FLAKES ?